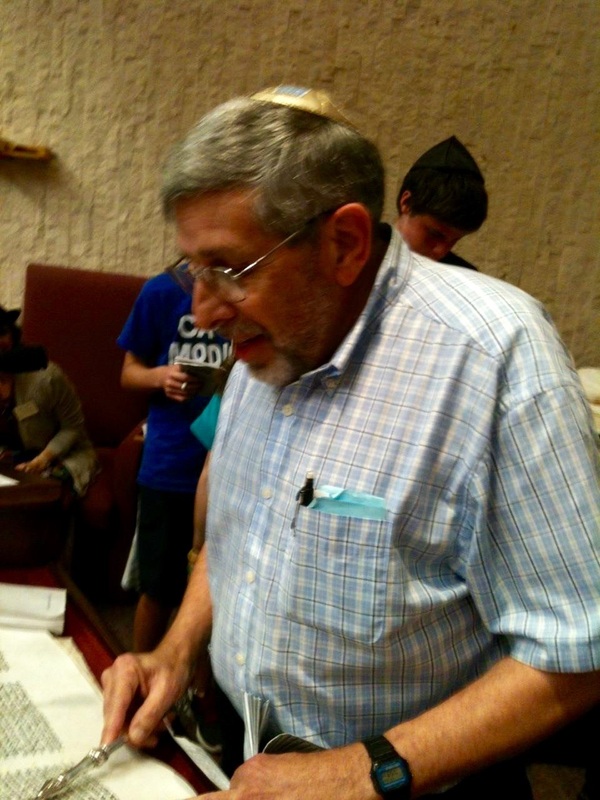 Elliott Fagin, Z”L, (1943-2015) was the Ritual Director of Temple Torat Emet. Here he is reading Megillat Esther on Purim in 2013. It is with broken hearts that members of Temple Torat Emet mourn the loss of Yoel Yehuda ben Zalman v’ Bracha Rivka Leah, Elliott Fagin, of blessed memory. Our entire community is saddened by this loss to our congregation and to the Jewish people. We grieve together with his beloved wife Reva, and his children Leslie and Joel and their families. Elliott’s identity was closely intertwined with synagogue and Jewish life. Certainly if he were performing his familiar role of Ritual Director this past Shabbat he would have prepared the second Torah scroll for Shabbat Shekalim several days in advance. On multiple levels, it is fitting that Elliott’s final days corresponded with Shabbat Shekalim. A shekel is the basic unit of currency both in the Torah and in the modern state of Israel. The Torah in Exodus 30: 11-16 describes the taking of a census of the people in which the people, or at least the adult males, give one half shekel. Rich and poor give the same amount and are thus counted equally. The funds are used for the upkeep of the sanctuary. Parashat Shekalim is read as we prepare to begin the month of Adar, the last month of the year on the Biblical calendar. The following month, Nisan, is the month of spring, the month of Passover, the month of renewal. In ancient israel, the half-shekel tax was a sign to the people that as Passover approached, the community had to maintain communal institutions, starting with the Sanctuary. Elliott, spent the bulk of his professional career, or perhaps his first professional career, as a high school math teacher. Parashat Shekalim is certainly among the more math-focused Torah portions. Elliott’s second career as the much beloved Ritual Director of Temple Torah, now Temple Torat Emet, was focused on keeping religious life running like a well-oiled machine. It’s too easy to take this sacred work for granted. Elliott worked constantly and quietly behind the scenes to make sure that ritual life in the synagogue ran smoothly. Just as the priests of the ancient Temple applied the half-shekel proceeds to maintain the Temple, Elliott did the same as ritual director. He rolled the Torah scrolls; he invited members to lead services; he read Torah; he closely monitored the Jewish calendar for special additions or omissions in the service. These are technical areas of the Ritual Director’s role that were part of Elliott’s official duties, and he performed them well. Furthermore, he did everything with a special sense of love and caring. He always went well beyond the call of duty of any formal job description. He welcomed newcomers and helped them follow services. He taught classes on the synagogue liturgy. He tutored individuals, youth and adults alike, in Torah readings. With Purim just around the corner, this is the first year in which we won’t have Elliott as the reliable “clean up hitter” who picked up whatever portions of Megillat Esther that were not assigned to others or whose assigned chanters could not attend services at the last minute. Elliott could always step in on a moment’s notice. As Rabbi, I relied on Elliott a great deal to orient me to the congregation when I was new. He knew everyone’s name, even if they only came a few times a year. Indeed, he assigned High Holiday seats and knew not only names but where everyone sat. When I came to the congregation in 2011 from a much smaller congregation where the rabbi had to focus a lot more on the logistics of the services, I thought that the concept of a Ritual Director was the greatest invention ever. With Elliott in the role, he set the highest of standards, and I learned so much from him. With the lesson of the half-shekel fresh on our minds, I think the greatest lesson I learned from Elliott is to treat all people, rich and poor alike, with the same love and respect. As Elliott is laid to rest in New York, our community in Boynton Beach, Florida feels his loss in a profound way. On behalf of Temple Torat Emet, I extend heartfelt condolences to Reva and the entire Fagin family. Yehi Zikhro Varukh, May his memory be for a blessing.